187 x 133 mm. - 127 leaves. 14 of which with full-page miniatures, all with fully decorated borders, historiated with small figures, animals, and grotesques. 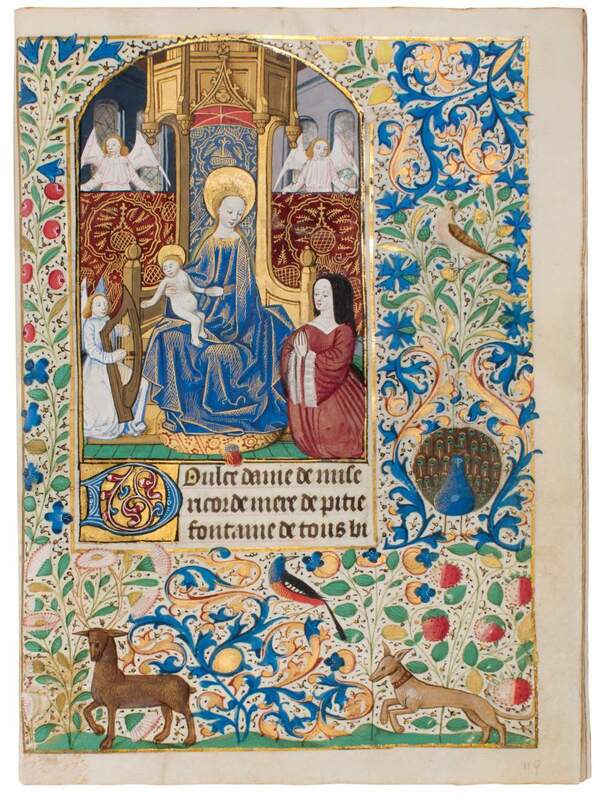 A fine Book of Hours made in the workshop of the Master of the Échevinage of Rouen. The anonymous patroness is shown kneeling before the Virgin and Child. Unidentified name Dupont with monogram mark. 187 x 133 mm. – 127 leaves. 14 of which with full-page miniatures, all with fully decorated borders, historiated with small figures, animals, and grotesques. This book, with bright, large margins, is an excellent example of the high quality of illumination made in the city of Rouen. Following the end of the English occupation of Normandy (1453, end of the Hundred Years' War), a new circle of clients in Rouen lead to a high demand for texts. From the late 1450s onwards, numerous manuscripts were created in the capital of Normandy, including Books of Hours, historical, and juridical texts. The best illumination of this period is attributed to the Master of the Échevinage de Rouen, named after a group of manuscripts made for the échevins, the aldermen of Rouen, one of the first public authorities in France to assemble a public library. The Master is thought to have managed an efficient workshop and to have hired assistants who were able to paint in his style. He also created models for the standard illustrations of Books of Hours. This artist was the most successful Norman illuminator of the third quarter of the 15th century, while his style and repertoire were continued by the next generation of Rouen artists. Compared with the large-format, secular volumes that the Master painted for the library of the Rouen Échevinage, this is a small, intimate, and personal prayer book, yet the illuminator lavished much care and attention on its decoration. The artist of the book at hand is an excellent illuminator with the ability to execute very fine faces. He seems to have quite closely followed the steps of the Master of the Échevinage de Rouen. Miniatures and borders are highly detailed and rich in incident: textiles are patterned and gilt, architecture is articulated and interiors may include arcades or a gothic sculptured throne. The narrative content is similarly expanded into scenes in the margins, in roundels containing ancillary characters or events.